When the weather is beautiful, we all want to enjoy the great outdoors. What is the best area to peacefully enjoy great weather? Don’t be surprised, but it’s right at home. With retractable screens, you can transform your backyard or front yard into a home oasis. Sunesta Screens are excellent retractable screens for homes of all sizes. One exceptional Sunesta screen is the Sentry Retractable Captured Edge Screen. This Sunesta retractable screen will help you extend your living space while providing you quality privacy. Sunesta retractable screen can even reduce your air-conditioning costs and overall energy build. No longer will you need blinds or curtains to keep your home interior cool. You’ll be fully in control of your sunshine and shade, while your home shows off your personality and style sophistication. Porch screening overlooking the pool. Covered Porch with Sunesta Screen, not only is it beautiful for an outdoor living room but you and your family will not have to worry about insects or other pests. The Sunesta Screen can retract whenever you want a full outlook of your home landscape. Beachfront outdoors space. This will provide you an absolutely amazing view of the ocean while entertaining guests for meals and games. Outdoor kitchen. Feel the breeze. Enjoy the food and drinks. Never will you have to slam your Sunesta retractable screen. Install retractable screens throughout your home property – windows, doors, porches, garages and more. Breathe in fresh air everyday. Sunesta Screens can be power screens or motorized screens. Sunesta Retractable Awnings, Screens, & Shelters. 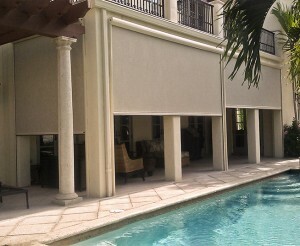 Learn more about Sunroll retractable screens today.